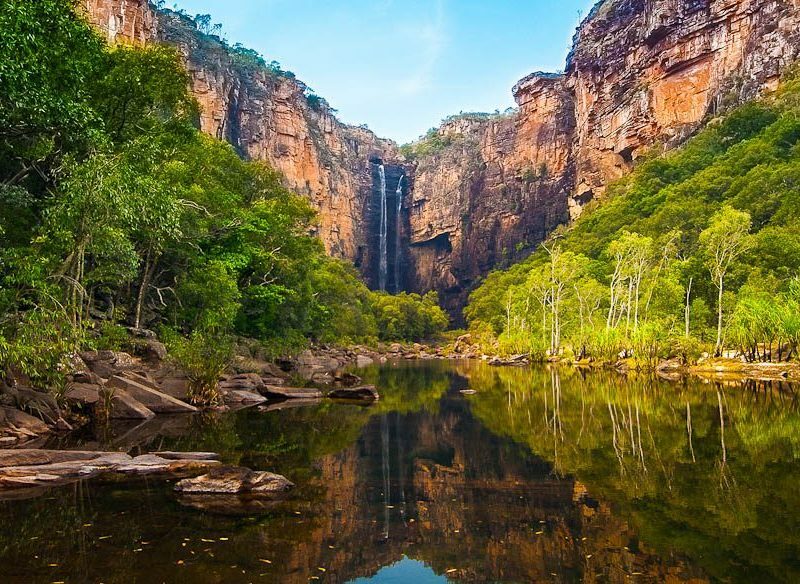 Jim Jim Falls, Kakadu (Photo: Tracy Ryan). Northern Territory photographer Tracy Ryan has a knack of capturing the majesty of Kakadu, in all its seasons and moods. Here are her top photography spots in the 20,000 square kilometre national park. 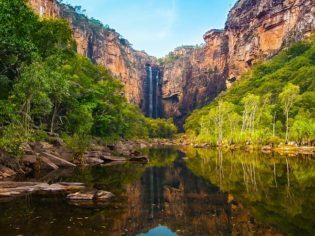 Kakadu’s ancient wetlands, escarpment, outliers, woodlands, and monsoon rainforests – home to our earliest Australians for more than 50,000 years – are a photographic and cultural adventure. The national park recognises the local indigenous calendar of six seasons, where throughout the year the landscapes undergo spectacular changes. The favourite time of year for photography enthusiasts to visit the park is ‘Wurreng’, in June and July (height of the dry season and its coolest time of year). Yet, all year round, in all of the seasons, there is always somewhere spectacular to photograph. Here are my favourite spots and the best time to photograph them. Enjoy! Dawn Mamukala Wetlands, Kakadu (Photo: Tracy Ryan). Make sure you get here early to photograph sunrise while waterbirds fly in for their first meal of the day. With the sun rising in a perfect spot opposite the well-covered observation platform, you will definitely be able to get that perfect shot. The sun rises very fast in the Top End, so make sure you arrive before first light. Oh, and, cover up; the mosquitoes are huge, plentiful and are there for a morning meal as well. Tips: Carry a tripod to keep your camera steady, set your ISO very high and use no flash. Also, a polarising filter can help to create vivid colours. Look carefully and see the couple – that will give you a better sense of the Nawurlandja Lookout, Kakadu (Photo: Tracy Ryan). Nawurlandja Lookout is a sensational spot, very easy to access yet still quite a secret. Not many people venture past the well known spot at Nourlangie – it’s only about a 500m walk up a slope. The well signposted spot affords spectacular, expansive views, taking in Anbangbang Billabong, Nourlangie and an escarpment in the distance. On a clear day, you can see forever! Tips: Use a good wide angle lens and a polarising filter to help create vivid blues and greens. Even with a ‘point and shoot’ camera on automatic you’ll get a sensational shot. Anbangbang Billabong, Kakadu (Photo: Tracy Ryan). If you can get into Anbangbang Billabong (check access) it is well worth visiting after Nawurlandja Lookout. In Wurreng, it is more likely that you will be able to access the circular walk around the billabong. If not, access is open along the entrance and down near the picnic areas. Head towards the end, look back, and you will see Nourlangie forming a spectacular backdrop to the billabong, which teems with birdlife and lilies. Beware of crocodiles! As the day progresses, the colours here change dramatically; the later you stay the more spectacular. Tips: A wide angle lens and tripod are recommended. Spectacular Jim Jim Falls is accessible only by 4WD (check access) and takes two hours one way, with soft sand prevalent in the last 10km of the track. Then there is a 2km return walk to the falls through monsoon rainforest and over boulders (make sure you are fit, wear good shoes and take plenty of water! ), taking you to a deep plunge pool where silica sand rests on the bottom, leftover from the ancient inland sea that once covered much of inland Australia. Ensure you allow a day for this trip if you want to take your time to get some good shots. Crocodiles have been sighted in this area, so heed the information at the start of the walk. You will be able to capture amazing shots all along this walk, but the best opportunities are not too far from the carpark, where you can capture the immensity of this ancient landscape and reflections in the water of the towering gorge. Tips: Use a high ISO in low light, but a standard lens will suffice. Animal Tracks Safari’s Goose Camp, Kakadu at sunset (Photo: Tracy Ryan). To capture the most spectacular sunset shots in Kakadu, head to my favourite place, Goose Camp – only accessible on a half day, Kakadu Animal Tracks Safari. This safari has access to wildlife-rich wetlands and tropical savannah woodland and includes an unforgettable, awe-inspiring bird gathering spectacle, where magpie geese, ducks, pelicans, kites, black-necked stork and brolga can be seen feeding and settling down for the night. Buffalo and crocodile may also feature. Tips: Make sure you take your long lenses if you want to capture intimate shots of the birdlife and a wide angle lens for sunset shots. Under exposure and a high ISO will make colours more vivid. Tracy Ryan is an award-winning landscape and nature photographer from Darwin. Aside from bespoke photography tours Tracy also offers a one-off aerial photography tours. See tracyryanphotography.com for more information. Ikakadu, my favourite place where I feel true serenity in Australia. A destination I could visit over & over again, there’s always new & exciting things to see & discover as the seasons change. The photos do Kakadu true justice. Thanks so much Penny. Kakadu is gorgeous all year round.